Sometimes in our quest for something new and fancy, we often forget what is old and simple is actually the best. 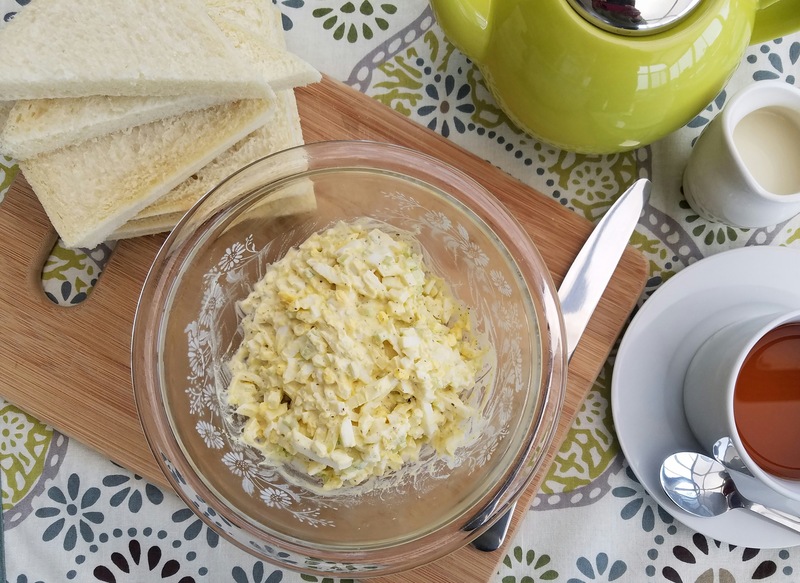 I’ve made this simple egg salad sandwich many times when the kids were younger. 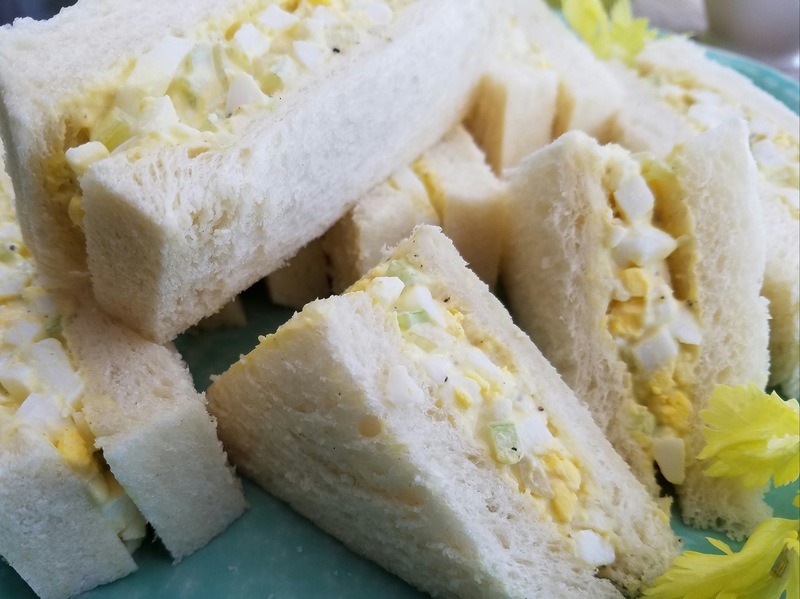 Now that they have all grown up and I do not need to prepare those quick-fix sandwiches anymore, I have not visited this recipe for quite a while. I was invited to a ladies get-together recently, and needed bring something fast, simple, and fit for a tea party. 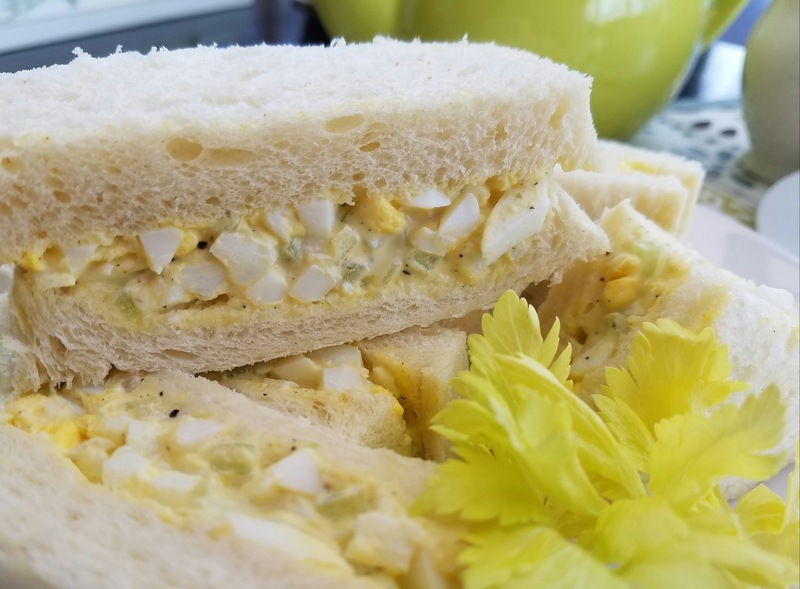 This good old egg salad sandwich recipe came to my rescue. Yup, it is still tasty as always. Don’t forget the good old stuff, they are the best! Prepare hard-boiled eggs. After many attempts, I figured the best way to prepare hard-boiled eggs is to bring the eggs to room temperature. So plan ahead and bring the eggs out from the refrigerator way before you need them. Bring a pot of water to a boil with 1 tsp of salt. Just before the water starts to boil, lower each egg into the water slowly with a slotted spoon. Be careful not to crack the eggs. Reduce the heat so that the water is just boiling gently. Let the water boil for 15 minutes. Turn off heat and add cold water to bring the eggs back to room temperature. Let the eggs sit in the water until they are cool enough to touch. Tap the egg all around gently on the counter-top to crack the shell. The shell should come off easily so that the egg is nice and smooth. Chop the eggs and transfer to a mixing bowl. Add the mayonnaise, celery, onions, salt, and pepper. Stir until blended. Add more mayonnaise if need. The filling should not be too wet. Set aside. Trim the crust off the bread slices carefully. Divide the egg filling evenly into four portions. Spread a portion of the filling on slice of bread. Cover with another slice. Be careful not to press the bread unnecessarily. One of my biggest pet peeves is to see fingerprint dents on my sandwiches. Never press the sandwiches with your fingers. Use a tool, like a square-end spatula if needed to press the sandwiches together. Cut each sandwich into rectangles or triangles as you wish. Keep refrigerated until ready to serve. The salad filling does not keep well. It starts to turn wet and watery after a day. So prepare the filling only when needed. Next time I will try Chinese celery instead. They smell and tastes the same as English celery but has a stronger green tone. 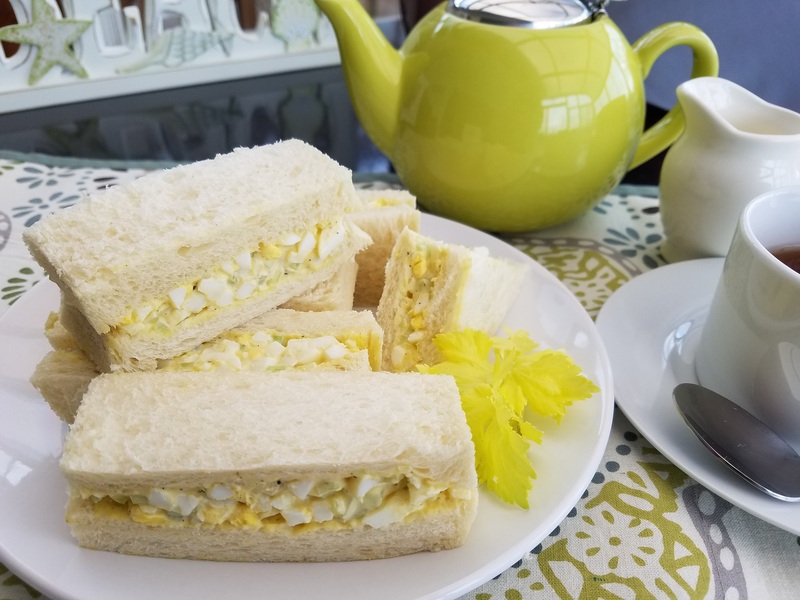 They will probably make the egg salad look even brighter and nicer.